If I tried to do a post in just five minutes, it would probably contain two lines (maybe), and that's it -- I'm a very easily distracted blogger! That is quite the challenge. I don't think any of my posts were completed in less than 10 minutes... let alone 5. If I were to guess... I'd say my average post takes anywhere from 30 to 60 minutes. P.S. Sweet card. I love 90's refractors. My five minutes - go: i really should post these trades but want to share some of my own cards. Dang it cat, must you be held NOW? What is that on the wall? Did I leave my car window down again? I forgot my bottle of water. I need a nap. Battery is dying on the laptop. great, the internet just cut out again. Now, where are those cards I scanned... Oh wow - I forgot he sent me these! I scanned these 8 months ago. TIMES UP. Crap. Guess I'll try to post tomorrow. This is a great idea! Maybe I'll try a modified version of this to get me back on track too. 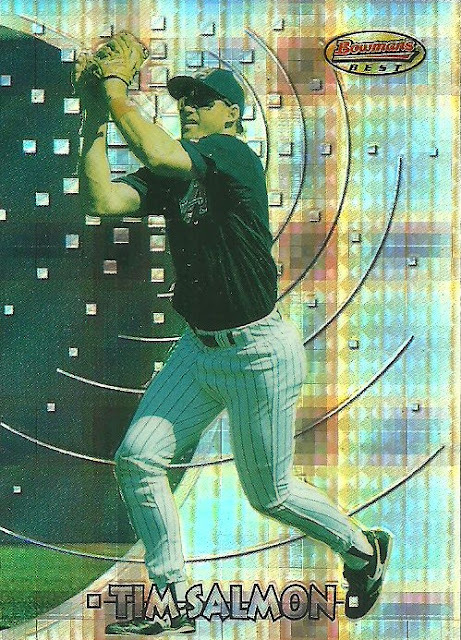 Btw, love late '90's era refractors! I am amazed at all the quality posts that have been made in the last few days (eek it's been two weeks of 5 minute posts?) for this "Blog Bat-A-Round" that you started.